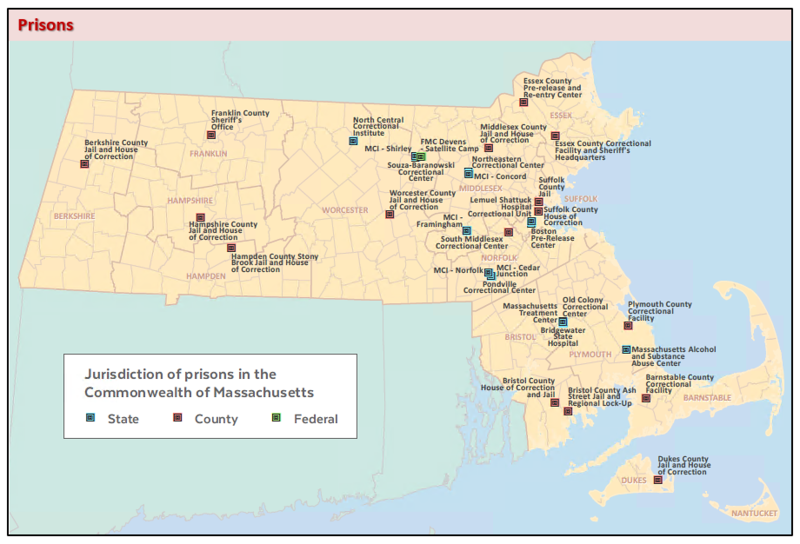 The Prisons point datalayer shows the location of all correctional facilities (state, county and federal) in the Commonwealth of Massachusetts that house inmates. Physical locations were verified from the websites of the Massachusetts Department of Correction (MADOC), Massachusetts Sheriffs' Association (MSA), Federal Bureau of Prisons (BOP) and individual facilities, and verbal communication with many of the facilities. Ancillary support facilities - treatment centers, process divisions, resource centers, etc. - are not included because there were no inmates living at these facilities. This layer was modified from its previous version, which was developed by the Massachusetts Department of Environmental Protection’s (DEP) GIS Program based on database information provided by the Department of Criminal Justice Information Services (DCJIS) (the state agency responsible for maintaining the Commonwealth's criminal justice information system), part of the Massachusetts Executive Office of Public Safety and Security (EOPSS). The EOPSS is also the parent agency of the MADOC, which operates the Commonwealth's state prison system. The layer is named PRISONS_PT. MassGIS staff compared the previous version of the data to the latest lists of facilities using ArcGIS. Data sources included MADOC Locations, MSA Locations, and the Federal Bureau of Prisons. Closed facilities were removed. MassGIS staff used the most current ortho imagery to verify the locations of all points and place them atop a building or within the center of the property. Location source attributes were dropped. Facility populations and capacity were omitted in this version since they fluctuate frequently. MassGIS maintains this datalayer. One facility - Bridgewater State Hospital - is part of this layer and not the Non-acute Care Hospitals layer because in all cases, the patients that are admitted to this facility may be charged with or convicted of crimes ranging from misdemeanors to major felonies. A zipped shapefile of the Massachusetts prison point datalayer. 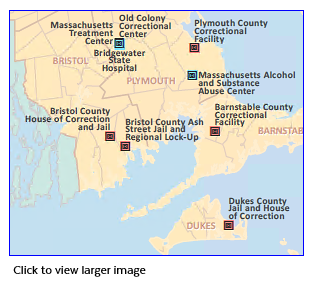 View the Massachusetts prisons layer in the online map viewer Oliver.